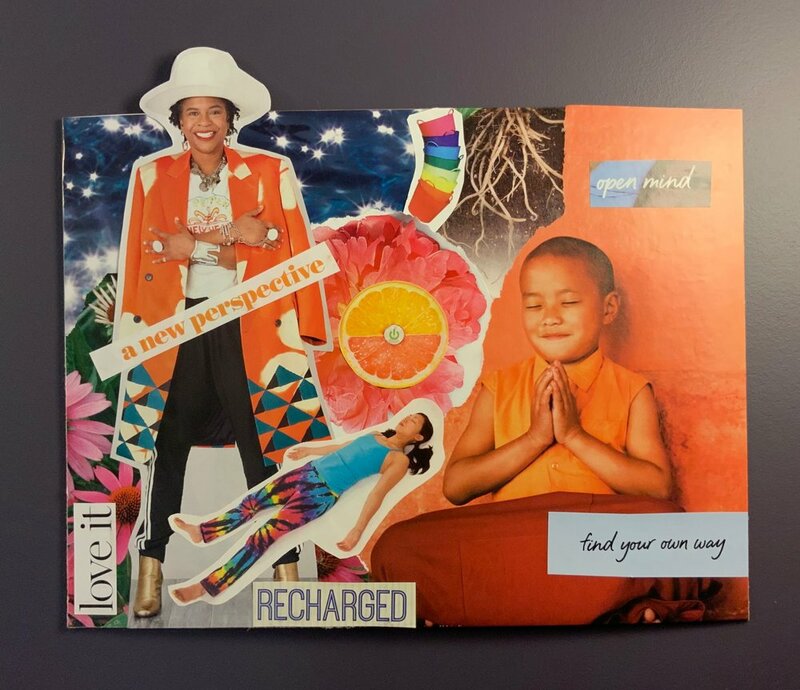 Yesterday - as part of a New Year Planning e-course offered by Lisa Work at Be Bright Studio - I created my business vision board for 2019. Vision boards are interesting things. It begins by ripping out images and words from magazines based on intuitive attraction. That part was easy for me – but when reviewing and editing my choices, I found that inner voice telling me that I didn’t have the right images, these weren’t going to work. You know, that inner critic that never wants you to succeed. The next step is to create a collage. When I finished it – I loved it. I loved the energy it holds for me. I love the colours and the words I chose. And I loved that I did something different this year. I included images of people. And although none of those images reflect what I look like on the outside – I resonate with their energy on the inside. Here comes my vision board to the rescue. A new perspective. What if I simply trust that the information is inside of me and that when I rewrite this document it will be even better, more refined and recharged energetically. After all, if you keep an open mind, you can find your own way of doing things that is uniquely you. And I can honestly say that I love it when it all comes to together this way. So, disaster averted thanks to some “random” images and words! Your Creative Edge™ 2019 is a 16-week spacious oasis of creative energy and ideas. It’s an intimate circle of women who want to connect, create, converse, be in community and find clarity. It included workshops, mini KMI Master Minds™, a book study, art journaling and more. If this is something that intrigues you, I invite you to take a look at the website here. Early bird registration opens Sunday, January 6. And, if you’ve never created a vision board, I suggest you give it a try – you never know where it might lead you. Wishing you a wonderful and delightful 2019. The concept of clutter has been on my mind a lot recently. In part (in full disclosure) because I am co-facilitating a Creative Clutter Clearing: KMI Master Mind™ on this topic. However, clutter is also very topical in the media these days and clutter clearing is proliferating as an industry with books, TV shows, YouTube channels, courses and even coaches aiming to assist. We live in a climate of excess. According to a study in a slate.com article written by Tom Vanderbilt, “One in 11 American households … owns self-storage space—an increase of some 75 percent from 1995.” And that was written in 2005! A 2017 9.4% SSA Self Storage Demand Study found that 9.4% of Americans rent a storage space. And I bet that stuff doesn’t bring happiness or a sense of accomplishment. Probably quite the opposite – as now it needs to be insured, cleaned, kept safe, and now stored. As I look around at the stuff I have accumulated over the years – and if I’m honest, still accumulating - I dream of a simpler life. I watch Tiny House and minimalist videos. While these inspire me, they seldom sustain any significant momentum towards clearing my own excess of stuff. And my clutter, isn’t just visible. It has spilled over into digital clutter. My iPad, cell phone and computer now need additional digital storage space. My email inboxes and e-folders are in constant need of purging. And then, there is my schedule and the thoughts I carry around in my head of things to do or that I could do. My clutter left me drowning in piles of paper, puddles of despair, feeling immobilized and overwhelmed. I started getting together with other people who are dealing with their own clutter issues. We gather online, learn tips, tools and techniques that can be explored and experimented with. We listen to each other, ask questions and draw out solutions that are personal and practical. We hold space for each other to set intentions and take action as we keep each other gently accountable. We also share giggles that keep the process upbeat and fun. We also take time to celebrate the Aha moments and small accomplishments. But best of all, is the sustainable momentum that acts, as one participant describes, as “a gently propellant”, making it easier to keep going. After all, my clutter didn’t materialize in a day – and it is going to take more than a day to minimize it. If clutter is something that you struggle with – consider joining our merry band of creative clutter clearers. This is based a blog I wrote last year but never posted. In 2017 I committed to emptying a drawer or a shelf each month. The results - read on to find out. My most empowering achievement in 2016 was … drum roll please … an empty drawer. In the fall of 2016 I co-facilitated Creative Clutter Clearing: a KMI Master Mind™ with fellow facilitator Donna Mills. A KMI Master Mind™ is process focused, and so I wanted to document my process of the tool, The 1/3 Rule, to share with the members during our Tips, Tools and Techniques segment. The aim of The 1/3 Rule is simply to reduce the contents of a space, a closet or a drawer by 1/3. The space I choose was my bedside dresser which has 3 drawers. I emptied everything out, threw away a bunch of stuff, sorted and found a different home for some items and then returned the remaining items to the dresser. Then, I decided to reorganize the space a little further. I decided to leave one drawer completely empty. I can’t remember exactly why, perhaps it was just a way to illustrate The 1/3 Rule. Either way that empty drawer became a huge source of empowerment. It was like a delightful little secret – a source of calm, control, an inspiration, a reminder that I can conquer my clutter. Occasionally, when the world felt like it was closing in I would just open the drawer to marvel at its expansiveness. That’s when I decided to start The Empty Drawer Project. I decided that each month I would empty one drawer or one shelf in one room of our house. A month gives me amble time to choose my target, plan and implement. As of January 2018 I have 7 empty spaces plus I have eliminated an entire display cabinet and a set of shelves. A few other spaces have been significantly reduced in stored items. What’s my bigger why? This challenge helps me to move towards my dream of building and living in a much smaller house. To be able to live a more simplified life that has less stuff to look after and be responsible for and more time for doing what I want. Less frustration at not being able to find things and less time to spent on cleaning and more on living. Are you downsizing? Adapting to an empty nest? Perhaps you just want to feel a greater control over your surroundings. Whatever ever your reason you aren’t alone in your struggle clutter. And you don’t need to deal with it on your own. I invite you to check out latest online series of Creative Clutter Clearing: a KMI Master Mind™. Join us for one, some or all in these independent sessions. Do you choose a word of the year or start a new venture in the first week? I do choose a word/phrase of the year – or rather I let it choose me. For 2018 it is Open Delight. I have yet to unpack the deeper meaning behind this choice, but then I have a whole year ahead to see what reveals itself. And yup – I’m a new venture kinda girl. This year I am taking my Ayurveda and Yoga Coaching certification with Carrie Hensley, and offering one of my own along with Kathy Kane – Your Creative Edge 2018 for women entrepreneurs. With regard to New Year resolutions, I’ve tried to release the need to set them – but I still think about them. It’s hard not to. This year I came up with a combination of resolution/intention and ideal day all wrapped up in one. I call it My Elegant Eight for 2018. These are eight things I would like to strive to meet each day. EASE into my day. This includes a morning routine connected to my Ayurveda training. EAT mindfully. No more diets or restrictions – instead I want to learn to eat more mindfully. I want to rediscover the connection and joy of eating food without judgment or censor. ENJOY life and all the many blessings and experiences it has to offer. EXPRESS myself through my art and creativity. EXPAND my capacity to serve. ELEVATE my thoughts and connections. ENHANCE my surroundings. This includes being a good steward to the land, and also reducing clutter in my home. I think these are doable. I find the alliteration playful so I'm more likely to stick with them. Now to see how 2018 unfolds and if it will be elegant! How do you greet the New Year so full of possibilities? Comment below - I'd love to hear your process. Small questions are a powerful tool. And asking small questions is both an art and a skill that can be improved upon with practice. Small questions are a key part of KMI Master Minds™ and the KMI Master Mind™ training. I started blogging for a couple of reasons. First, it was the consensus that if you have an online business you need to blog. Even if no one reads your posts somehow through the magic of metadata you will be promoting your business. Since I haven’t blogged in almost 8 months, I guess that wasn’t motivation enough. Donna is a, IIHA-Certified Hand Analyst, Certified FranklinCovey, ARTbundance and Kaizen-Muse Creativity Coach, KMI Master Mind Facilitator and Creative Clutter Clearer. You can learn more about Donna on her website www.printsonpurpose.com. I’m not a researcher. But Research seems to go along with Readand Review. And if I have to research something, I enjoy it a lot more if I’m Relaxed. I have to admit that a few years ago the first thing I thought of was the logic game Mastermind by Parker. I'm actually pretty good at it. Then my geeky side would bring to mind, pun intended, the talent of Star Trek’s Mr. Spock and his mind-meld technique. I found this oddly comforting. What do Kaizen and Mouse Poo Have in Common? Other than being small, Kaizen and mouse droppings were the impetus I needed to tackle my clutter and clear my space. As an introvert I need my space. I crave space. I long for a special space to call my own. That special space came to me, via my husband, who gifted me with what I like to call my Studio Cottage. At our marina there are two main buildings. When a long term tenant moved out of one, I moved into their office space ... a room build within a large unheated quonset hut boat shed. One wall is curved with two windows looking out onto Georgian Bay. I painted it bright happy colours and had a new floor installed. I swore that I would keep this sacred space clean and clear of clutter. Several years later, many projects plus and the selling of my childhood home found that longed for sacred space a repository of stuff. This past winter for the first time, mice found their way in. They explored every inch and excreted everywhere. Did I mention I have a phobia about mouse poo! Ugh. The combination of cumulated clutter and mouse droppings was too much, too overwhelming, way too big of an energy drain and so I just shut the door and walked away. But as the weather warmed the space once again beckoned to me. I decided to use my Kaizen training and start small. First I just thought about how I wanted the space to be. I would mentally rearrange the furniture. Small thoughts are so less overwhelming then big thoughts. Clean one window sill was so much easier to contemplate than cleaning the whole space. Then I added some small questions. How did I want to feel in this space? Not resentful and angry at the mice but creative, inspired, calm and rested. How could I feel more of the latter and less of the former? The great thing about small questions is they don't require an answer right away. Once asked, the brain percolates and ponders to produce plenty of possibilities. Next came small steps. Small steps helped me to get started. They helped me to break through the resistance I was feeling about tackling what seemed like such a huge and impossible task. So with broom in hand I began a little at a time over, several days. I actually started to thank the mice because it made throwing things out so much easier. Those ancient unfired pottery creations lost all appeal once they had mouse poo in them. And so the contaminated objects found their way, one by one, into the garbage bin. As the space became cleaner and clearer I started rearranging the furniture and fixtures. I took some pieces out and swapped others for items that fit my needs and space better. Is it perfect? Nope. But it is so much closer. And that is really what Kaizen is all about, moving in a positive direction closer and closer to your ideal. The goal is not about reaching an ideal but growing and being enriched by the process of moving continually towards it. What I find so wonderful about the Kaizen approach is that using it reduces fears that can paralyze or overwhelm us. I can be far more productive taking small actions and celebrating with small rewards, like time in my hammock, then in the past when everything had to be perfect or not worth doing at all. I'm currently reading Quiet !mpact: How to be a Successful Introvertby Sylvia Loehken. She totally normalizes being an introvert and offers great strategies for different real life situations. One challenge I have as introvert is talking about myself and what I do in the world. The following list gives you a little glimpse about me. Did I Dot the "i" in Details? New launches are exciting. There is a rush of anticipation, excitement (sometimes masquerading as fear) and a healthy dose of creative chaos. Fellow coach, Kathy Kane, and I just launched our signature program, the KMI Master Mind Facilitator Certification Training. Every time we thought we had everything ready it seemed like we discovered another layer of details. Details became synonymous with delay. Details, in general, are my death and my default. My creative process is to think BIG, to think really, really big. Thinking big builds excitement and enthusiasm and I fall in love with my project. But when its time to get to work my default mode kicks in. I begin to think of every single possible detail that needs to be done. Ahhhhh If I'm not aware this is happening it can be the death of a promising idea. Enter Kaizen small steps to the rescue. Small steps create tiny moments of success to keep the process moving. Kaizen small steps let you focus on just the very next thing to do. And sometimes the very next thing is to walk away, to eat, to nap, anything but the details. On February 20th we hit publish on our website and officially launched our training program. There are still lots of details to attend to. Still lots to learn about launching. And I'm not sure if I dotted the i in details but that's OK.
My next small step is just to pause and look back at how far we have come. How much we have achieved and how excited we are to get started. What strategies have you found for dealing with details? Share in the comment section below. is my exploration into topics that peak my curiosity and engage my need to know more. I share how I see the world through everyday topics like my challenge with clutter, my love of ideas and master minds, creative strategies, health and nature, all though the lens of Creativity, Kaizen, Ayurveda & Yoga.